September 1, 2014 The Popular International Committee to Support the Gaza Strip launched a campaign yesterday to raise $1 billion for the rebuilding of the Gaza Strip; $100 million is set to support shelter and emergency relief services in the enclave. 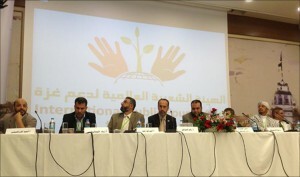 The committee, which held its first forum in Istanbul, announced the formation of the Popular International Committee to Support the Gaza Strip. The participants called for the activation of relief campaigns and convoys to break the Israeli siege imposed on the Gaza Strip and to continue organising international activities to support Gaza, demanding Israel’s occupation of the Palestinian territories come to an end. They stressed on the need to take all legal measures before local and international courts wherever possible to prosecute Israeli officials for their crimes against civilians in the Gaza Strip and urged the Palestinian unity government to assume its responsibilities towards the Gaza Strip and its citizens without discrimination or distinction and to lifting the Israeli blockade as well as the establishment of the port and the airport. They also called on Egypt to open the Rafah border crossing to allow the transfer of aid and construction materials as well as humanitarian convoys to meet the Palestinians’ needs and facilitate the exit of wounded individuals. The two day forum, which was attended by 250 participants from 35 countries representing more than 70 foundations, was sponsored by Qatar Charity. The participants presented research papers highlighting the Israeli aggression and its implication on the deteriorating humanitarian situation in Gaza. Essam Yusuf was identified as the head of the new organization. Mr Yusuf is also the long time head of INTERPAL , an important UK Palestinian charity, and former head of the Union of Good, both important parts of the global Hamas fund-raising network. He is also the head of the “Miles of Smiles” Gaza convoys referred to in the above report and which are close to Hamas in Gaza. Wael Saqqa was identified as head of the founding forum for the new organization. Mr. Saqqa is a Jordanian engineer, long-time member of the Jordanian Muslim Brotherhood and founder of the Arab And International Commission To Build Gaza, discussed below. Zaher Birawi was identified as the coordinator of the International Campaign to Break the Siege on Gaza (ICBSG), a part of the Gaza flotilla movement who’s Vice-President is Mohammad Sawalha, a former Hamas commander and a leader in the UK Muslim Brotherhood. Mr. Birawi is the long time media and public relations spokesperson for the Palestinian Forum in Britain (PFB) , a part of the UK Muslim Brotherhood and Hamas support infrastructure and also a director of the Palestine Return Centere (PRC) which has also strong ties to Hamas and to the Global Muslim Brotherhood. In July 2012, we reported on a meeting with Hamas leaders that included Mr. Birawi. Necati Ceylan ( President of the Türkiye Gönüllü Te?ekkülleri Vakf? (TGTV) , an umbrella group founded in 1994 to foster ties amongst Islamist NGOs in Turkey.